Scotland Saved Their Blushes With An Immediate Rebound, But Was It Enough? Scotland recorded a 2 nil victory away at San Marino, a much needed 3 points in their 2nd EURO 2020 group I qualifying match, to bounce back for a damaging 3 nil defeat at the hand of Kazakhstan in their 1st group match. Though a whitewash was expected from Scotland over San Marino, the lowest ranked team on FIFA’s ranking list, the acquired 3 points was a welcome one, a sigh of relief for the Scots. When the draws that pitched Scotland into group I was made, it was taunted to be a mountain to climb for the Scot, the stern opposition was not expected to come from Kazakhstan, Cyprus and San Marino though, it was expected to be from Belgium and Russia, who completed a group of 6 countries, but a 0-3 defeat at Kazakhstan, a team which is ranked 117th by FIFA, some 67 places below Scotland, made the already high mountain, sky high for Scotland. 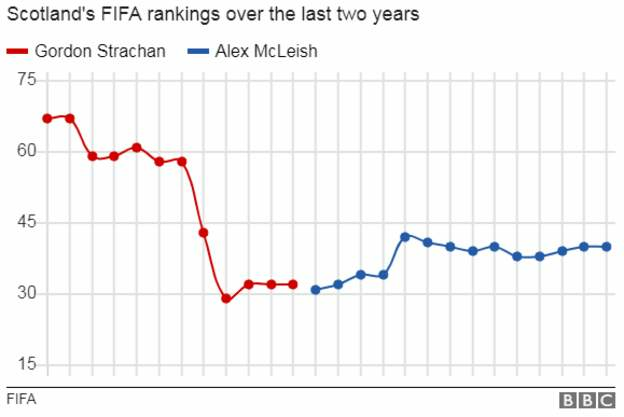 In defence of Scotland coach, Alex McLeish, who has done fairly well since he took over from his countryman, Gordon Strachan, He had gradually improved the teams standing on FIFA log from 67th place to 40 as shown above, He went into the match against Kazakhstan without some key players such as Liverpool left-back and Team Captain, Andrew Robertson, Celtic’s Kieran Tierney, Bournemouth’s Ryan Fraser and Cardiff’s Callum Paterson, and with no real quality to replace them, McLeish’s hands were really right. However, the loss was still shocking and looked to have dented Scotland slim chance of making it out of the group. It was their heaviest defeat in a competitive match since a 0-3 loss to England in a World cup qualifier years ago in November 2016. 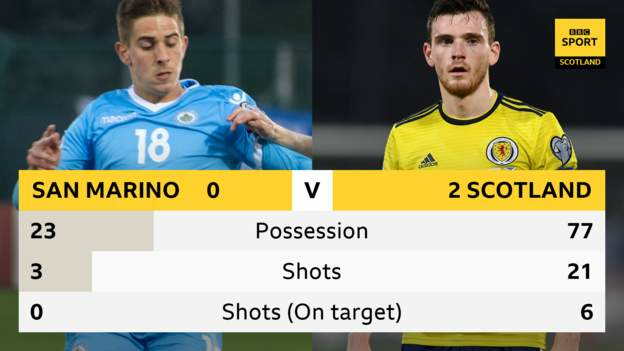 Scotland went into the 2nd qualifying match against FIFA lowest ranked team in San Marino which is ranked 211, with their fans certainly expecting a response, a whitewash of San Marino, and with the key players back in the team, why not? however, they could only manage a 2-goal victory. An early goal by Kenny McLean and another late in the game by Johnny Russell secured the 2 nil victory, to the disappointment of some of their travelling fans who believe after 2 games, their country should at the least sit on 3rd place in group I, behind only Belgium and Russia, but found themselves 5th behind both Cyprus and Kazakhstan also, booed their team after the final whistle. Scotland put up a better performance than in the game against Kazakhstan as the stats suggested, and rightly so, they played against the lowest ranked team in the world, nevertheless, their finishing in front of San Marino goal let them down, Kenny McLean who got the 1st goal could have easily been on a hat-trick, but he often flopped his line. Scotland had 21 shots in total (in contrast to 10 against Kazakhstan) and only managed 6 (just 2 against Kazakhstan) on target, including 10 corner kicks (3 against Kazakhstan) against San Marino’s zero. With tougher matches ahead against Belgium and Russia, Scotland sure needs to improve on their shooting in front of the opposition goal. One of the major factor that will determine who qualifies among Belgium, Russia and Scotland, the so-called big boys of group I, will be the results against the lower ranked team (Cyprus, Kazakhstan and San Marino) in the group, Scotland certainly started on the back foot on that note and will need all the luck football offers to turn things around in their favour. Some might say it is too early in the group to jump into conclusion just like Scotland manager McLeish said, but it is hard to see who will bet against Belgium and Russia to lose against Kazakhstan, Cyprus and San Marino either on away ground or at home.